Despite its brief running time (only 7 minutes long), this film packs a punch. Both narratively speaking as well as emotionally. For the most part we only see a woman (a terrific Erin Roberts) in the car, basically having a nervous breakdown. We get a glimpse of what she is going through but it’s never explicitly-said what she’s suffering from. And that’s the beauty of Fox’s script, that what the protagonist is going through is something we could all relate to. A lot of our frustration, anguish, rage, etc. are internal struggles, something we feel so intensely more so than something we physically experience. I always admire stories that deals with heavy subject matter without making it too heavy-handed. There is a lightness to the way the story unfolds, especially in the key scene where the woman interacts with the homeless street musician (Sean Emery). Both actors are so great in their roles and were memorable in conveying the emotions of their respective characters. I love the music too, which adds so much to the uplifting tone of the movie. Director Jeremy Bandow did a wonderful job telling this story beautifully. The use of special effects to emphasize the theme of ‘speed’ gets the point across in a fun and efficient manner. Kudos to the filmmakers involved in making this a memorable short that’s both inspiring and entertaining. Last Thursday I had the privilege of chatting with three of the women behind this wonderful short film. 1. When I watched the film, I felt like this is personal story that’s perhaps based on a real-life experience. Is that the case? Can you tell me what’s the inspiration behind this story? ​Yes, this really happened to me. It happened 10 or so years ago and I’ve told the story to people and it always gets a strong response from people, so I sure it had emotional power. When I received free classes at FilmNorth (formerly IFP), I took one in writing film short form and when we pitched our ideas for a short film in class, the instructor said THIS is a short and encouraged me to do it. I already knew I wanted to do it but this confirmed my instincts about it. 2. How did the short film come to be? Did you know the director, Jeremy Bandow, before you collaborated on this film? I actually went to graduate school with Jeremy and we’ve always had the same aesthetics, a similar taste, in film. As a finalist for a grant, I got to take this class in web series/short film at IFP for free. And since I had this idea for a while, because the story of this film actually happened to me word for word, I pitched this idea to the class. I got encouragement from that class that my idea is perfect for a short. The teacher said it’s the kind of stuff festival programmers are looking for, where there’s something at the end of it, it’s like a ‘punch to the stomach’ so to speak, that opens your mind to think of something in a different way. 3. I love that the film opens with John Milton’s quote ‘The mind is its own place.’ How did you come up with that quote that’s so perfect for this story? ​I’ve been sort of obsessed with that quote for years. I first encountered it in book of daily inspirational readings called Pocket Full of Miracles by Joan Boasanko. It is from Paradise Lost by John Milton. The quote completely encapsulates our protagonist’s issue in the film. The “problem” is merely how she’s choosing to “think” about it. 4. 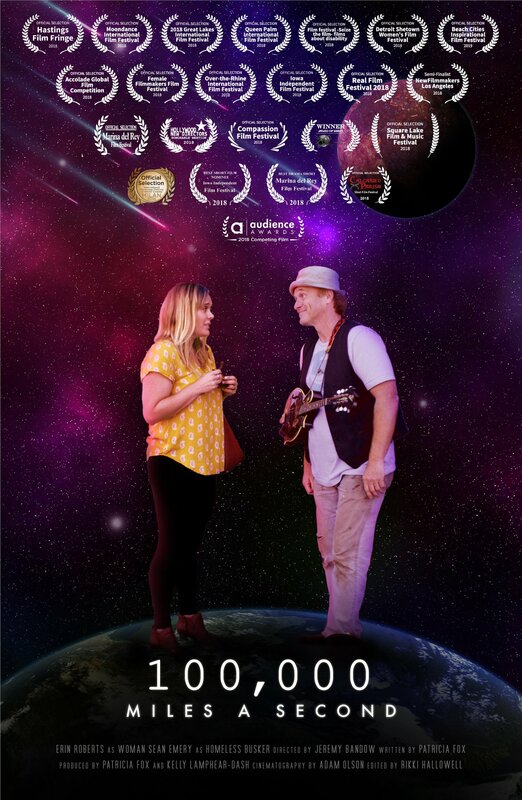 I’m also curious about the intriguing title ‘100,000 Miles a Second.’ What’s the significance of that title for you? The homeless guy I had this encounter with said that’s how fast we are traveling in the universe. It turns out, that speed is about half the speed of light. I thought it was a powerful title that would get people’s attention. 5. Despite the serious subject matter, there’s a lightness to the way the film unfolds, and there’s such cheerfulness in the way the street musician interacts with the woman. Is that a deliberate tone that you and the director agree on? ​Yes, it was deliberate. I want the message to be positive and give people the room to make up their own minds about what it all means. A lot of it has to do with the actor we cast, he’s extremely engaging, he is a performer, and we wanted to use his strengths as an actor to help us spin this tale. 6. Tell me a little bit about the music in the film, which somehow fits perfectly and adds such richness to the story. The real street musician I encountered at the Co-op was playing a fiddle and he was playing Bluegrass music. So I knew I wanted the same type of sound for the film. Just so happen that the actor, Sean Emery, knows how to play the instrument and this type of music. It’s in the call sheet when we’re casting that it’d help if the actor has a musical sense and can play music. He actually performs at the State Fair and he had taken class with our casting director Cynthia Uhrich, so he turned up to audition for this role. He ended up writing the song in the end credits, apparently he wrote it a while ago and never did anything with it. He played it for us and we thought it’d be perfect for this movie. 7. Since you also produced this film, what’s the process like in finding the right producer and cast to bring your story to life? Kelly asked to be part of the project, which I gratefully agreed. Once I asked Jeremy Bandow to direct, he brought the shooting crew with him. They work together a lot. We knew all all the extras personally. We found the other people we needed to bring in during post production, like the sound designer. Since we were working on a hot set in the form of a busy, urban store open for business, but we also wanted to play with sound during the speed up and slow down of motion sections in the film. 1. How’s the experience making this film different from your theater experience and other acting jobs you’ve done in the past? In my experience film is very different from theater because you don’t have a lot of control over the outcome. I kept checking in with writer Patricia and director Jeremey and reminding them that they needed to tell me if I wasn’t giving them what they needed on camera. It’s hard as an actor, (and as a control freak), to hand over that power to someone else therefore The trust level must be very high and I learned that quickly. Luckily I had such amazing collaborators. Specifically with film, after the shoot, the final product is completely out of our hands as actors. The film, the TV show, the video, is all made in post production. So the actor needs to Step back knowing,!and hoping, that they did their job, then let it go. It’s very very different work for me. 2. How did you prepare for the role of The Woman who suffers from MS? In prepping for this role playing Patricia, an actual person living with multiple sclerosis, I just wanted to talk to her… A lot. I wanted to hear her thoughts and feelings and experiences now, and during the onset of the disease, which is when this short film is set. The film is so relatable because it’s not just specifically about MS but about people going through personal and very difficult times in their lives. I was less worried about imitating Patricia and more focused on bringing the essence of her experience to the screen. As per the physicality, she struggled with issues in her left foot which caused her to feel uncomfortable on that side while she walked. As an actor it’s important to me that I don’t pretend that something is bothering me- that will just show a “ quality”but not specific realism or reality. For me I needed something real to remind me that that left side was trouble. In preparing for the role I walked around with a rock in my shoe as a physical reminder that there was something that’s bothering me. Ironically on the day of the shoot I walked outside and saw one of my neighbors nephews Lego blocks on the street, a bright color red, which was a color Patricia and I had talked a lot about for this character, and I knew that would be My “rock”. I taped it to the ball of my foot and the rest of the day walked around with it sticking into my foot as I walked. It worked like a charm. It hurt like hell. And I think did the trick. I have that Lego block on my desk as a reminder. 1. How did you come across this project? Have you and Patricia collaborated before? I’ve known Patricia for many years. We met in a screenwriting class and have been part of a writing group ever since. I had been encouraging her to produce something since she has so many wonderful scripts. This was actually a new script; however, it immediately had interest and momentum to being done. It made logical sense that this would be the one to get produced. 2. What have been the most challenging part in making this film? Securing the location, finding the talent, getting the crew together all fell into place extremely easily. The challenging part was the weather on the day of the shoot, which was all outdoors. We had to cut it short. Then we had a time delay of a few weeks to be able to go back and re-shoot due to the talent’s schedule. It’s a challenge to make sure everything looks seamless. Added to that was the issue of the green screen for the little bit of special effects that were used. Again, in post trying to make it look seamless. Oh and on the first day of the shoot, there was the major the solar eclipse! It was August 21st, and I remember we almost called it off. But I felt like, considering the storyline and themes on this film, astrologically, things had to get started that day! The weather did get the better of us that day, so we had to wrap things early, but yeah the first day of shoot was indeed when the solar eclipse happened! 3. I know you’ve produced several documentaries before. Is this the first narrative short you produced? How’s that different in terms of process with producing documentaries? Yes, actually it was. The main differences are related to the size of the production. In documentary, you usually have a skeleton crew and a single or couple for the interview subject. In narrative, there is a much more detailed crew to handle all the various aspects, especially about lighting, plus tech for maneuvers like dolly shots, etc. For talent, you have to have makeup and wardrobe, plus set design, props, etc. Of course, you have the talent, which can be anywhere from one person to one hundred. Even though this story centers around the two main characters, there was still a fair amount of extras, plus we were at a real co-op that had customers coming in and out that we had to control. The biggest shift is that in documentary you have to capture what is interesting in the real world that applies to your story versus in narrative you are altering your surroundings to create the world of the story.